Bulgaria is an European country in the Balkan Peninsula. Sofia is Bulgaria’s capital and largest city. It is a land of mountains, rivers, and rolling plains. The Balkan Mountains extend east to west across northern Bulgaria. The Danube River forms much of Bulgaria’s northern border. Between Sofia in the west and the Black Sea is a low-lying region called the Valley of the Roses. For more than three centuries, farmers in the region have raised Kazanluk roses for their fragrant oil, a prized ingredient in perfumes and a Bulgarian export specialty. To the east, the dramatic Black Sea coast drops from rocky cliffs in the north to sandy beaches in the south, where tourist resorts attract visitors from around the world. Heavy snowfalls in the mountains create a paradise for winter sports. Bulgaria’s location as a crossroads has made it the center of many struggles for power. An independent kingdom for many centuries, Bulgaria was a major power for long periods during the Middle Ages. At different times its rulers controlled much of the Balkan Peninsula, and its Orthodox Christian religion and culture influenced many Slavic peoples of southern and eastern Europe. Following almost 500 years of rule by the Ottoman Empire, Bulgaria regained its independence in 1878. After WWII, a government backed by the Soviet Union, the occupying power, was established in Bulgaria. During the period of communist rule, Bulgaria’s leaders enforced an industrialization program in an effort to modernize the country’s largely agrarian economy (see Communism). Bulgaria remained a communist-ruled country until democratizing reforms began in 1989. In 1990 Bulgaria held its first postwar multiparty elections and changed its name from the People’s Republic of Bulgaria to the Republic of Bulgaria. Bulgaria’s transition toward democracy and a free market economy has not been easy. The fall of communism and the loss of the Soviet market for Bulgarian goods led to a massive contraction of the economy. The standard of living plunged amid rising inflation and unemployment, rampant corruption, and the collapse of the social welfare system. Many Bulgarians emigrated. The Bulgarian government remained committed to reforms undertaken in the late 1990s, however, leading to greater political and economic stability. 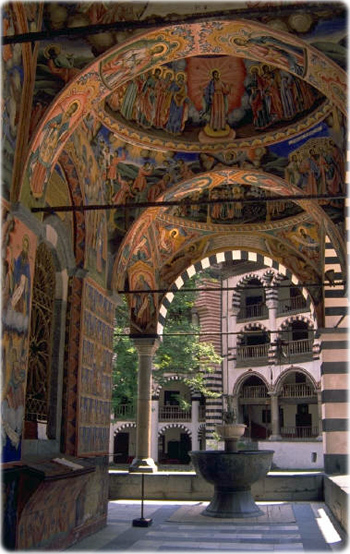 Inside Rila Monastery, founded in the 10th century.